So, do you have your jukebox yet? It was a big deal when a lot of guild members got their juke box all at around the same time. Several people set out into the world to find all the music scrolls. If you get 20 scrolls, you get the achievement, Azeroth's Top Twenty. This gets you the toy, Portable Audiophone, so you can take your music anywhere. 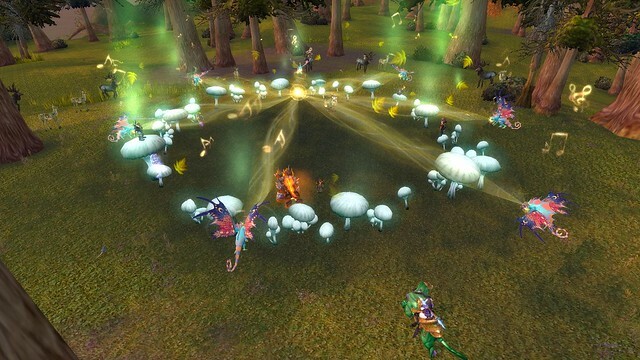 The above is the mystical mushroom circle in western Tirisfal Glades. Sprite darters converge on this circle to sing. It's a very interesting song so make sure you're playing with your volume on. I don't often have the volume on, particularly when I'm doing battle. I find a large amount of battle sounds annoying. This used to be a random event, unpredictable as to when it would happen. Now, because a music scroll drops from the center, it occurs roughly every 30 minutes. The whole event lasts for 5 minutes. The sprite darters start assembling at the edge of the circle and start singing. Their song heads to the center. You click on that junction to get the scroll. If you look around, you'll see the deer of the forest, which are ravaged by the scourge, come to the edge of the circle and are untargetable. Once the event is over, you can kill them and, if you're standing on top of one, it will attack you. They are level 80 so it's easy to dispatch them. You can find the circle by getting to the sewer entrance to Undercity. Once there, you'll need a flying mount. Fly west and a bit southwest. You'll come to an area of the map where there is a lake surrounded by forest. You might need to run around a bit south of the lake to find the circle. You'll need to devote a maximum of 30 minutes to wait for the event to start. When it's over, if you've never been here, jump into the lake just north of the center island and swim to the bottom. Any guesses on what that's doing there?